Level 3-1 is the first level of Fire Mountain in Mario vs. Donkey Kong. The high score for this level is 28500. The level opens with a cinematic showing Mario jumping onto a moving platform, which is then lifted by a Lava Geyser so Mario can reach a high platform. 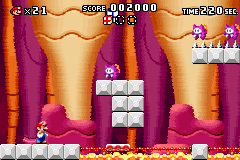 The player begins next to two moving platforms, which are occasionally lifted by lava. 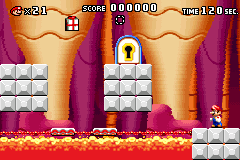 The player has to crouch under the two giant stone blocks to reach the other side of the area where the Key is. The player then has to ride a platform up to jump onto the first stone block, then they have to wait for a platform to rise in the center so the player can jump across to the second stone block, where the locked door is located. The second area has several Ninjis jumping on spikes. The player first has to crouch and ride the platforms to the other end. The second platform will rise, allowing the player to jump onto a Ninji with a 1-Up Mushroom above it. Using the Ninjis, the player can either jump right and use another Ninji to reach a moving platform, and then use two Ninjis to reach the Mini Mario; or jump left to reach the two Ninjis, skipping the platform. Red: In the first area, between the platforms. Yellow: In the second area, above the upper moving platform. Blue: In the second area, above the Ninji to the left.